• Each cart is 42” wide by 192” long with oak hardwood decks (they can take a beating). • Five evenly spaced internal sockets along the deck edges allow for two 12” removable sides, also made of hardwood. • Permanent racks stand 60” above the deck with arms extending 18” from the cart’s center. • Pipe insulation covers each rack for quiet operation. • Running gear consists of two swivel and a pair of rigid Champion, forged-steel casters with 10” by 2 ½ Duralast® wheels equipped with precision ball bearings. • Cart rated for loads up to 3,000 lbs. 1. Treads eating silver shavings? 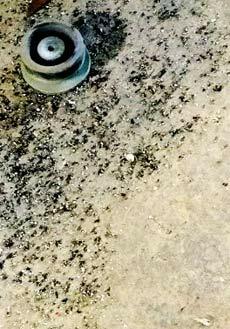 In settings where metal shavings are part of the floor décor, your wheels might be in trouble. Shavings destroy treads by virtually eating them alive. Choose a wheel type that offers resistance, like Poly-Soft® or Duralast® XC. 2. Wheels suffering from the elements? Phenolic wheels are what you’d call hydrophobic. 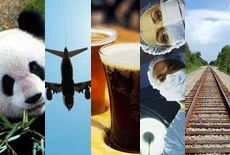 They deteriorate in water, oils and chemicals. Use wheels designed for a liquid environment, like Nylast (nylon), Unilast (solid elastomer) or Aqualite (polyolefin). 3. Carts making you deaf? 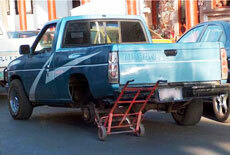 If a cart is so loud you can’t hear over it, the tread might be worn down, or the wrong wheels were installed. We can build nearly any caster or wheel for quiet operation. 4. Ball bearings gone rogue? Casters can loosen over time, allowing ball bearings to escape. If you see large gaps where the ball raceways are, it’s time to buy replacements. Without any ball bearings, your caster won’t swivel. 5. Carts causing back aches? If a shot of grease doesn’t fix that once-easy-to-push cart, you should replace the casters and wheels. Causes might be lack of regular lubrication, flat spots on the wheels, or bearing failure. 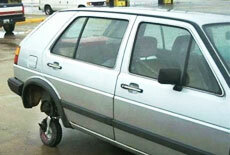 No spare tire or cash for a replacement? Slap a caster on it. That’s what these folks did. Note: We obviously love casters and we stick them on just about anything. But please, don’t actually try this. • Running gear makes carts mobile. Does it make sense to skimp on a rig’s vital organs? • Longer life, less downtime, lower maintenance and greater productivity outweigh the initial cost savings. • Inferior products and designs usually result in inefficient, awkward and unsafe carts. 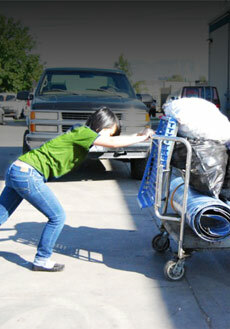 • Superior roll ability means fewer workplace injuries like back strains or worse. • Four-wheel caster steer: Two swivel and two rigid casters. Our most popular style. It’s economical, and easily turned or pushed straight, and trails well. • Four-wheel diamond pattern: All rigid casters. Tilt-type that turns on center wheels. Lowest cost and suitable for light loads. • Six-wheel tilt or non-tilt: Four swivel and two rigid casters. Recommended for heavy loads and extra long trucks. Turns in its own length. • Four-wheel non-tilt: All swivel casters. Can be maneuvered in any direction. Ideal for confined areas, but swivel locks recommended for straight-line control. • Four-wheel diamond pattern: Two rigid and two swivel casters. Highly maneuverable. Usually tilt-type, can be non-tilt. Not recommended for ramps. 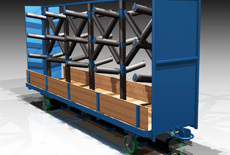 • Wagon (fifth-wheel steer): Features large axle-mounted wheels for heavy loads. Usually power towed. • Make your profile you. Most people treat their LinkedIn page like a resume, but it should be more conversational. Include brief personal anecdotes and asides that reflect your personality. • Connect with people you know. LinkedIn is the perfect avenue after you've made initial contact with a customer. Just don't add everyone you want to sell to. Take your time, build relationships and follow through on LinkedIn. • Get recommendations and make them, too. Work with a great customer? Write them a positive, personable recommendation and it will show up on their LinkedIn profile. This builds credibility for both of you. Likewise, ask your clients for recommendations. • Join groups and get involved. Network with other sales professionals and listen to what they’re talking about. Have tips or news to share? Post it in the groups and spark discussion. We recommend joining a few groups and staying active in them. For more LinkedIn tips, check out this article from Search Engine Land.